Lais Myrrha investigates the instruments and knowledge forms that construct our experience in the world from the place we occupy in it. Dictionaries, maps, flags, anthems, newspapers and newscasts are a few of the elements in which the artist intervenes. For her, art is an opportunity to throw oneself into areas of instability, into situations where the familiar becomes odd and conventional logic seems to fail. In her works, Myrrha explores the idea of impermanence and history told from the perspective of the ‘defeated’, as well as the precariousness of the concepts of equivalence and balance. An important aspect of her creative process is the selection and precise use of materials, which reveal the attention she pays to the ability to signify, to function symbolically and condense narratives. 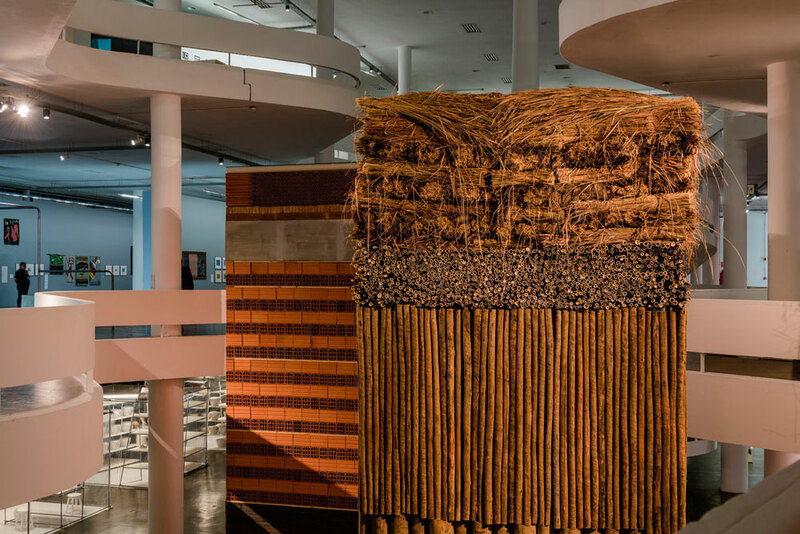 In Dois pesos, duas medidas [Double Standard] (2016), the artist builds two towers with the same dimensions composed of stacked materials. For one of the towers, she uses materials found in indigenous constructions (woody vines, logs, straw), for the other, those used in typical Brazilian construction (bricks, cement, steel, glass, pipes) – two methods that embody ways of life and two different projects of society that, even if they are possibilities for construction, already declare their forms of ruin.